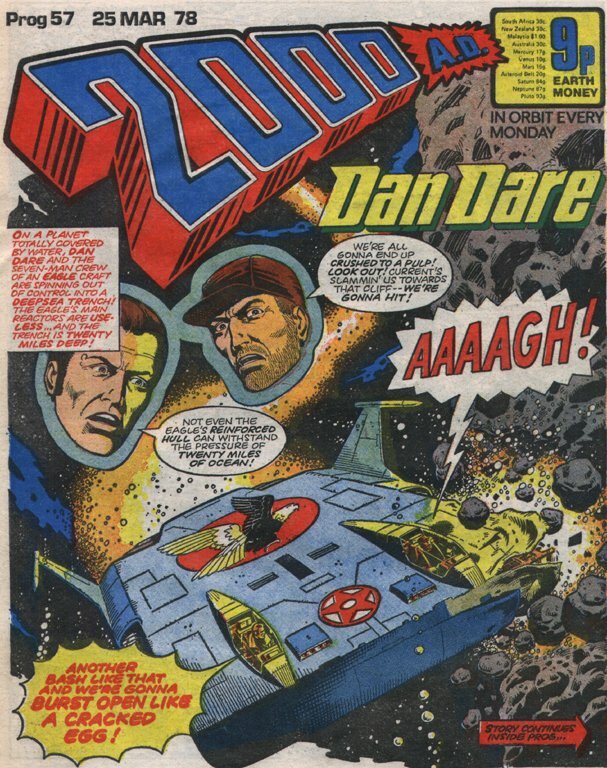 This prog featured the penultimate Dan Dare cover in Dave Gibbons' extended run and Colony Earth, Dan Dare, Judge Dredd, M.A.C.H.1 and Walter The Wobot strips. The Harlem Hellcats almost have to concede defeat. Last appearance of the Long Island Sharks. Inferno, Rule 37: Any Inferno team failing to field a minimum of six men, must concede the game. Final score: Harlem Hellcats 3 cave-ins (5 points), to the Long Island Sharks 0 cave-ins (0 points). The Harlem Hellcats win the brand new Inferno superliner and accessories. His body armour absorbed trhe blast of his jet-pack explosion. He is rendered unconscious by Giant's jet-pack explosion. He is heavily concussed. Listed as a substitute, he returns just in time to prevent to the Harlem Hellcats from being forced to concede the match. He breaks his arm in Giant's jet-pack explosion. He hurts his arm in Giant's jet-pack explosion. Marvin has been nicknamed the 'Flying Ape'. Commentator: "And Moody Bloo is going to block it!" Moody Bloo: "I ain't just gonna block it, Blabber-Lips...I'm gonna moider it!" Jaws Jessel: "Better start runnin', cave-man...Before I stuff this ball right down your..."
Louis Meyer: "(Tsk, Tsk) Such language." There's a shout of "Inferno!" from either the commentator or crowd. Louis Meyer returns to his original spelling of Mayer. Also the final scoreboard is illegible. The resolution to the cliffhanger is disappointing, but the action of the Inferno match is great. The cliffhanger ending is oddly undramatic, because Giant is more interested in the prizes than any revelation Louis Myer has too offer.